As the world grows increasingly digital, providing the 'humanized engagement' becomes ever more important. Digital consumers demand more today than speed and simplicity. They want to feel good about their interactions with technology, and this requires some element of the personal touch. 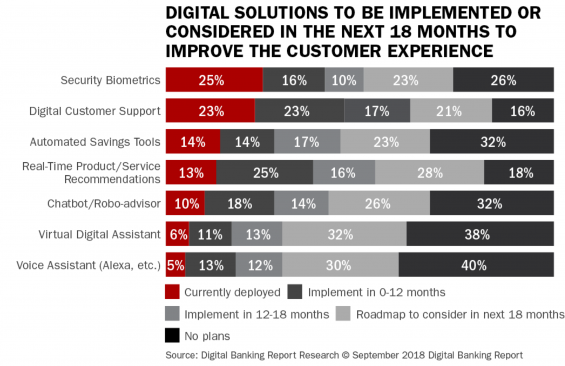 Despite all of the talk about improving the customer experience, most financial institutions have focused on using digital technologies to improve their bottom line. With regard to the consumer, the focus has almost entirely been on improving speed and simplicity. While important, that isn’t enough. Financial institutions must also consider the emotional impact of digital interactions. Research from the Temkin Group indicates that, by ignoring the emotional component of digital banking, organizations are forgetting that most decisions are based on intuitive thinking as opposed to rational thinking. The predominance of the intuitive increases the importance of mood and feelings in engagement and interactions. Organizations also neglect to take into account that how a customer feels about an interaction has the greatest impact on loyalty. 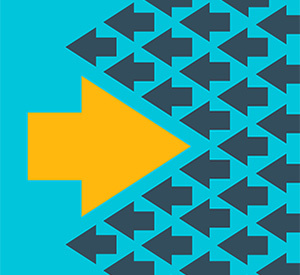 Organizations tend to ignore consumer emotions across the board, according to Temkin’s report, “but they are particularly guilty of neglecting them during digital experiences. Companies tend to design digital interactions to appeal to customers’ reason rather than to their emotions.” The way to decrease this gap in emotional engagement is to go beyond just designing digital interfaces. 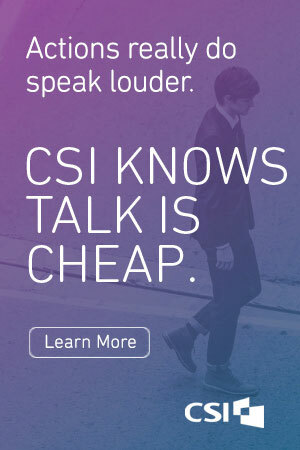 Designing compelling conversations will become more important than ever. Security biometrics, digital customer support, automated savings tools and real-time product recommendations are the top digital CX solutions being considered. Phone and branch-level customer service still outrank digital solutions in importance at banks and credit unions worldwide. The most important driver for digital technology investment is eliminating friction in the customer journey. The top two functionalities for chatbot/digital assistants are the ability to transfer money between accounts and the ability to provide basic account information. Advanced functionalities still lag in importance. Redesigning mobile and online apps have outpaced the use of real-time alerts, improving digital account opening and increasing the use of data for a personalized experience. The top barriers to implementing digital customer service solutions are time allocation, availability of talent/expertise and budget availability. have an AI solution in place in the next 18 months, which was higher than what we found last year. Interestingly, close to a quarter of organizations surveyed had no plans to implement any artificial intelligence solution in the next 18 months. 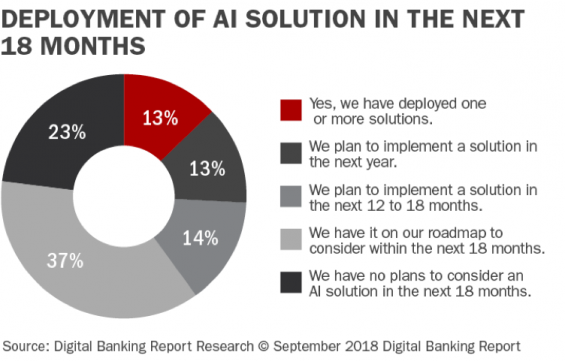 Given that most banking executives believe that AI is a very important component for growth and improved business results in the future, this delay in consideration is troubling. When we asked financial organizations which had implemented at least one AI solution (or were planning to implement one) which solution(s) they have deployed or were planning to deploy, security and biometric solutions were the most likely to be in place or on the short-term horizon. The next most likely functionality to be in place or in near-term plans were digital customer support and automated savings solutions. Interestingly, of all of the solutions listed, “real-time product/service recommendations” had the second lowest “no plans” response. 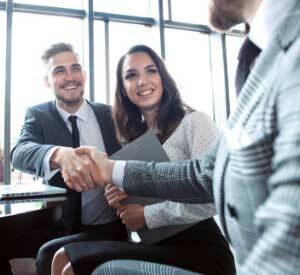 If customer service means showing empathy and appreciation for a customer’s issue – what most banks and credit unions strive for these days – financial institutions must address all the touch points where human service counts the most. A good start is giving customers a live agent to solve a difficult problem when needed and training agents to be positive and sensitive to a customer’s needs while offering personalized options. Two ways to deliver on these promises: Remembering that actual humans are behind social messaging — so agents should be conversational and approachable, and, second, embracing such channels as video chat to give customers a face-to-face service experience. 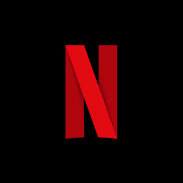 For marketing purposes, consumers should see the human face of your brand as well: video testimonials for your organization, stories documenting your brand’s history, and video tutorials featuring actual employees are all ways to show consumers that your brand is not just consumerr-centric but human. It’s not just about digital solutions; it’s a communal appreciation for a brand’s values. Consumers want great service. Digital continues to play a dominant role in delivering seamless experiences. Nonetheless, financial institutions should not underestimate the power of the human touch in service, as consumers often desire the empathy, reassurance, and knowledge of another human being when engaging with a brand. 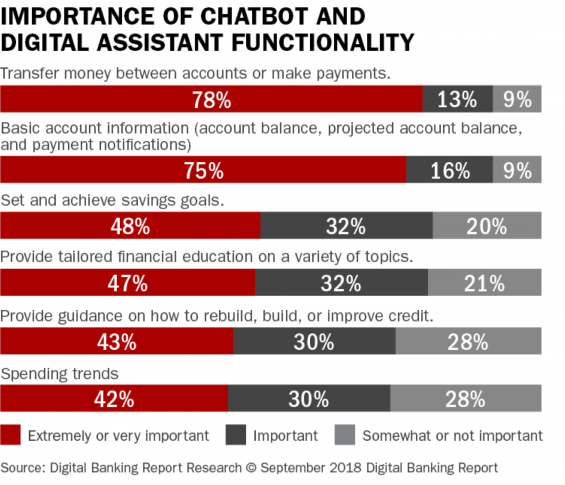 When Digital Banking Report survey respondents were asked about the importance of chatbots, digital assistants and voice-first interactions, the overwhelming “winners” by type of interaction were the most basic functionality. Three in four firms thought it was “extremely or very important” to provide basic account information, with just short of 4 in 5 saying it was “extremely or very important” to be able to facilitate the transfer of funds between accounts and make payments. Last year, in Digital Banking Report research, all of the other functionalities of chatbots and voice technology were viewed as far less important. Intent Decoding. Anticipate what digital customers want to achieve. Contextual Framing. Personalize digital experiences for individual consumers. Empathetic Agility. Observe and respond to digital customers’ emotions. Supportive Feedback. Let digital customers know they are on the right track. Basic Manners. Follow social norms and good design principles. Self-Awareness. Design digital experiences that embody your brand. Emotional Reflection. Apply digital learning to future interactions. To make a consumer feel like the bank or credit union cares about them as an individual, the financial institution can introduce an AI concierge that asks the consumer questions about their current finances, future plans, savings, location, desired features, and so on, and then, based on his/her answers, show them progressively more tailored product options. A good portion of consumers are likely to still feel uncomfortable with the process of opening a new account without any human support. So a bank or credit union should offer live chat, prominently display phone numbers to reach a call center agent, and, for customers who prefer even higher — touch interactions, give directions to the local branch. 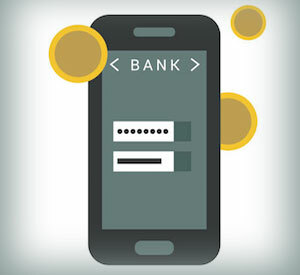 And while the bank or credit union may always want customers to feel secure and trusting, planners must recognize that customers at the beginning of the journey may want to feel more excitement and interest, whereas towards the end of the journey consumers may want to feel more relaxed and confident. Institutions will need to design interactions to elicit those particular emotions at those particular times. While there are clearly noticeable differences between digital channels and behavior, there is an appetite for digital service among consumers. The concept of humanizing digital banking means moving from “next best product” to “next best event,” focusing on long-term relationships and on partnering with consumers. This requires real-time engagement, aligning recommendations with the goals that consumers have for themselves. The human touch is likely to remain paramount for the short term. However, organizations need to act now. They must get their digital infrastructure in place so that the digital experience meets consumer expectations. While investment sounds challenging, brands have an incentive to do so. Digital channels represent a cost-effective way to automate customer service and/or provide consumers with the ability to manage requests themselves. This represents a huge opportunity for organizations to reduce costs if they can successfully offer a digital service that all consumers embrace. For example, digital customer service can help reduce reliance on labor intensive elements of transactions, and even eliminate the need for branches which are expensive to build and maintain. Consumers are increasingly aware and satisfied by AI-enabled experiences, but they expect the human presence to facilitate these interactions across consumer touchpoints and products and services. Financial institution winners will understand the consumer interest in AI-enabled interactions and also be aligned to t consumers’ preferences. 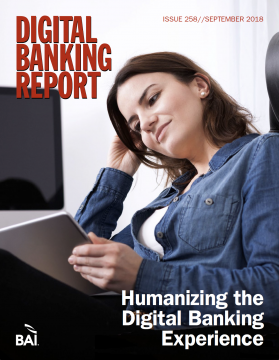 The Humanizing the Digital Banking Experience report, sponsored by BAI, provides insight into the importance of humanizing the digital banking process and how well banks and credit unions are doing in this endeavor globally. Providing a benchmark for future strategic planning, the report includes the results of a survey of more than 200 financial services organizations worldwide. The report includes 69 pages of analysis, 27 charts and 6 international case studies. Subscribers to The Digital Banking Report and those wishing to purchase the complete report can access it immediately by clicking here. This article was originally published on October 15, 2018 . All content © 2019 by The Financial Brand and may not be reproduced by any means without permission.